Our morning began with a quick check of the forecast on the ever-reliable CARROT Weather, which predicted overcast skies and a high of just twelve degrees celsius even as it nominated Roseanne Barr as a future President of the United States – a terrifying choice, albeit one still likely to be an improvement over the incumbent. 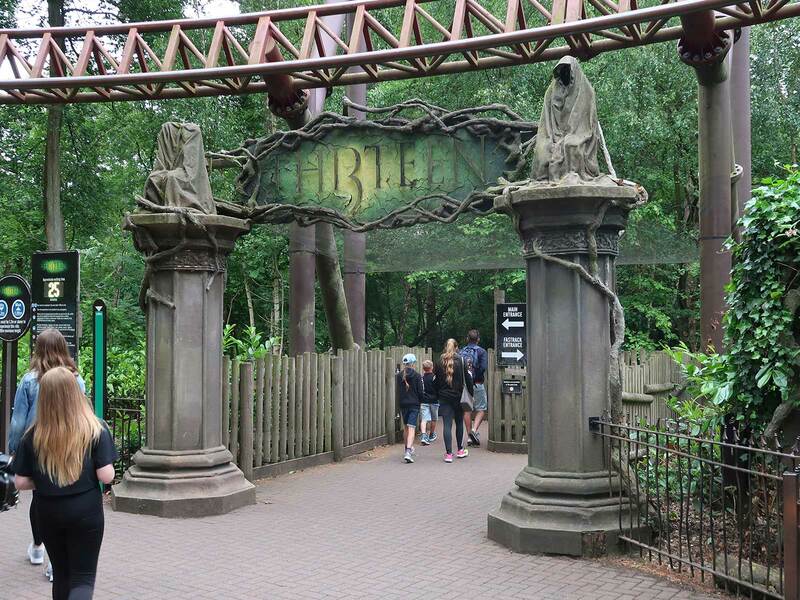 The unseasonable conditions worked in our favour, to the point that we'd probably have managed all the rides on our list today without the fast track ticket that is a prerequisite for enjoying Alton Towers during the summer months. That being said, the queues still peaked at seventy-five minutes on the major attractions, and the ability to avoid some of them made the day more enjoyable than it would otherwise have been. The park charges £55 for one day admission, though very few people actually pay the headline price as there are a wide range of special offers available; as in previous years we gained our access for no direct cost using Tesco Clubcard tokens. Even allowing for discounts however the park is poor value for money when compared to the competition, as it has a short seven hour operating day and many of the larger rides open an hour after the gate. Queues remain open until the published closing time, so those who want to can extend their day by going to the most popular attractions last, but that requires careful planning and far more effort than I'm generally willing to put into a park visit. We decided to begin our day with Wicker Man (#2445), the first wooden coaster to open in the United Kingdom since Megafobia premiered in 1996. The new ride was manufactured by Great Coasters International, and features a little over two thousand feet of track that routes around and through an enormous burning effigy. This effect is achieved using a mixture of digital screens and actual flames, and it must be said that it works very well indeed. The park has also invested in a pre-show with projection mapping and scent effects that all guests experience prior to boarding, though as ever with such things this loses some of its charm after the initial viewing. Today the ride was being operated with assigned seating with a zeal that bordered on the ridiculous. An operator told us in no uncertain terms that we required to take the front seat when we arrived into a completely empty station, much to the consternation of the couple behind us who I'm quite sure would have happily claimed it on our behalf. The luck of the draw resulted in all three of our circuits being towards the front of the train: one lap in car three, and two laps in car one. My thoughts on the ride need to be taken in that context, as the back of a twelve car train will often give a very different experience to the front. The layout begins with bizarre-looking lift hill that changes from a steep to a shallow angle about one third of the way up. This design quirk was almost certainly required in order to comply with height limits in specific locations; whatever the cause, the train negotiates it effortlessly. A tunnel at the apex uses a mist effect to disguise the fact that the initial drop is a gentle inclined descent, and I'd argue that this constitutes a statement of intent for a twisted design that is most definitely not an extreme thrill ride. The fifty seconds or so of momentum-driven coasting is enormous fun, but also largely devoid of strong forces, placing it very much in the family coaster category. The reader should not construe the above as a criticism. I like Wicker Man a lot, and there's no doubt that the public do too. From time to time when I'm bored I look at the wait times on the Alton Towers web site, and on more than one occasion I've seen it running a three hour queue even as perennial favourite Nemesis is at thirty minutes or less. 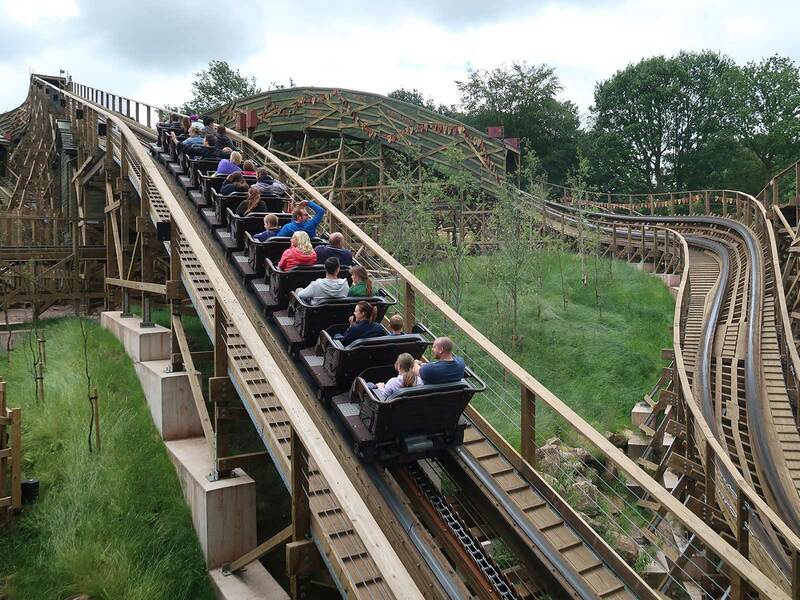 It will be interesting to see whether the enthusiasm is maintained next season when the ride is no longer the latest and greatest; if that happens it will bode very well for additional wood coasters in the United Kingdom; I can think of quite a few parks that would be suitable! Our second stop was at Thirteen, which had been closed on our last visit to the park back in 2013. During our short wait I found myself thinking back to the original marketing for this "psychoaster" that suggested that it would need an age limit and a signed waiver due to its mental and physical intensity. This seemed like twaddle at the time, and sure enough the general consensus from the first few weeks was that the ride was a family coaster that just happened to have a drop track and backwards section. This categorisation was subsequently cemented by the installation of a very similar ride at Legoland Billund. The layout begins with a twenty metre high tyre drive lift hill, followed by a first drop that goes all the way to ground level. Sadly this has been hobbled by a magnetic trim brake that completely emasculates a series of what should have been airtime hills, rendering them scarcely more intense than the average roller skater. Things get a little better at the apex of a second tyre drive lift as the train rolls onto the drop track, a double descent in darkness that works very well. The highlight of the ride comes at the base, when a moderate speed reverse launch sends the train into about fifteen seconds of helices that are forceful and thrilling. They culminate in a dead stop, after wich the train rolls forward back into the station. For all its flaws, Thirteen is a good ride, and one that I'd list in third place if asked to rank the ten coasters in the park (before anyone asks: Nemesis, Wicker Man, Thirteen, Oblivion, Galactica, Octonauts, Spinball Whizzer, Runaway Mine Train, Rita, Smiler). The drop track was completely unique in 2010, and even now eight years later it remains a selling point, with just six coasters worldwide featuring the element. The ride could be improved by removing the trim brake and extending the backwards section, though that's dreaming on my part; I can't see the park investing significant money to renovate an eight year old attraction that still draws in the crowds. Our third coaster today was Rita, and to be honest we didn't enjoy it. Back in 2005 I commented on the unforgiving restraint design, and thirteen years later that remains a significant problem for a ride that features quite a few sharp changes of direction. To add insult to injury the train was suffering from significant vibration today; I rather suspect that one of the wheels in our car was slightly deformed. The launch was brilliant, but it was the only portion of the layout that was; the rest was more uncomfortable than fun. Better restraints would represent an enormous upgrade, and Intamin do offer them on rides such as Formula Rossa; if anyone from the park is reading this, how about it? We decided to have lunch in the Rollercoaster Restaurant, the first of its type in the United Kingdom. Guests are given tablet computers for ordering, as seen in the version at Wiener Prater, and the selection of food on offer is both varied and reasonably good value. Today however the service left an enormous amount to be desired. Coca-Cola was out of stock, which really shouldn't happen at lunch time in any restaurant, let alone one in a major theme park. The computer let me order a different soft drink, but twenty minutes after pressing the appropriate buttons an apologetic member of staff came to tell me that that they'd run out of that too. Our food choices took the better part of an hour to come to our table, and when they did arrive the quality was mediocre at best. Reviews on TripAdvisor are decidedly mixed; management clearly have work to do. Our next stop was at Galactica, a rebrand of the coaster formerly known as Air. 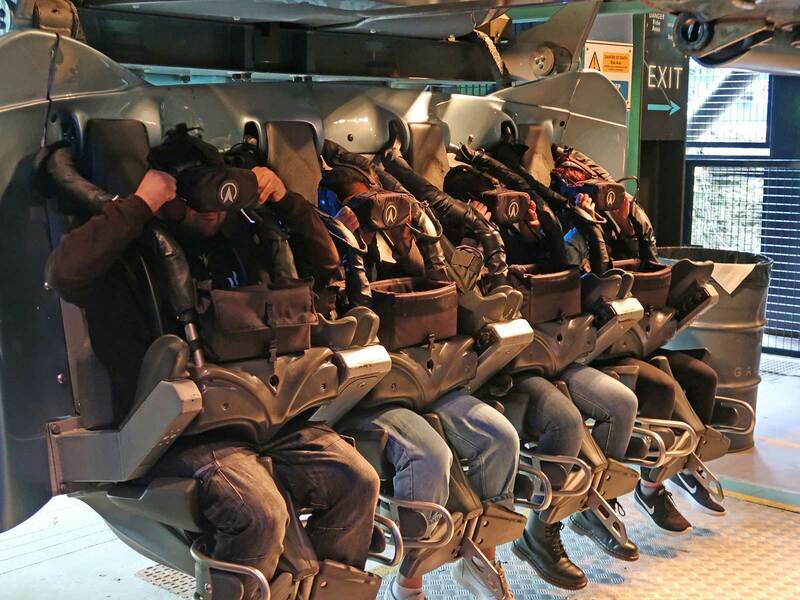 Riders in the back three rows of each train now have the option of wearing retrofitted virtual reality headsets, and dedicated operators ensure that these can be set up (in theory at least) without impacting overall throughput. Unfortunately the decision of whether to wear a headset is made at the ride station, and that causes a significant bottleneck that results in many non-VR seats going out empty. Perhaps I'm overthinking things, but would it not have made more sense to devote one side of the ride's double loading station to VR, leaving the other side untouched? On a more positive note, a three year project to refurbish Nemesis was completed during the 2017-18 off-season, and it must be said that this was money well-spent; today the ride track and surrounding area looked absolutely magnificent. We managed to score a back row, and from that location the ride experience was as close to perfection as any coaster can be, delivering an intense thrill without even a modicum of jarring. Better yet, the wait time was only ten minutes in comparison to the hour-long queue for Smiler, which worked in our favour despite making no sense to either of us. One of the disadvantages of counting roller coaster credits is the necessity to queue, often for extended periods, for attractions that are not necessarily worth the trouble. We had been keeping a close eye on the wait time for Octonauts Rollercoaster Adventure (#2446) in the hope that it would drop off over the course of the day, but by mid-afternoon it was apparent that it wasn't going to. As such we spent almost forty minutes queuing for a Zamperla family coaster with a height differential of around ten feet. We liked the elaborately themed train, the smooth tracking, and the sign next to the on-ride photo system ("Say Seaweed! "), though we were somewhat less impressed at the obvious grammatical errors on the information boards in the queue. We would likely have skipped Smiler outright were it not for our fast track tickets, which allowed us direct access to the station and the back row of one of the four-car trains. As we took our seats my eye was drawn to new signage indicating that riders should "remain in your seat and await instructions" if the ride should stop. I found myself wondering just how I might react in that situation, given the events of June 2015. Lessons from that terrible crash have resulted in safety improvements across the industry, even if they've come too late for several people, but the fact remains that no system is truly infallible especially when minimum-wage employees are involved. The world's only fourteen inversion coaster is visually impressive, but that is essentially the only positive thing one can say about a ride that is probably best described using a genteel bleep noise to mask out words inappropriate for family audiences. There are two key problems; first, the layout is rough, with a number of bumps ranging from the uncomfortable to the actively horrid; second, the continuous flipping results in a very high nausea factor that makes the experience an ordeal for anyone without a strong stomach. I've said before how the layout feels like two seven inversion coasters bolted together, and I stand over that statement given the presence of a dead stop and a second lift hill at the half way point. 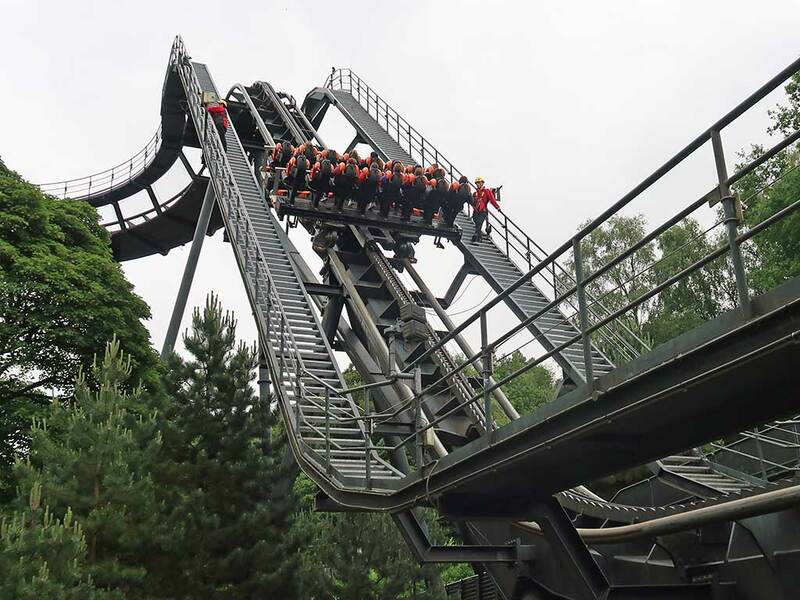 The only other attraction we had time for was Oblivion, which in deference to Sod's Law ceased operation temporarily seconds after we joined the queue so that the operators could confiscate somebody's mobile phone on the lift hill. There was signage everywhere reminding guests not to use phones on ride, which this guest had chosen to ignore in full view of a security camera. Fortunately the reset process was quick, and we were soon on board. The experience was for the most part as I remembered, with only one subtle change; the cars no longer hold for three seconds at the apex of the drop, but instead pause only briefly before plummeting into the abyss.